1-Call Cleaning Services have a number of different auto scrubbing machines at our disposal for all types of cleaning applications. 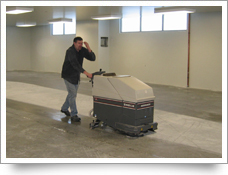 From small walk behind auto scrubbers for smaller areas of ceramic tile or other floor types, to a large propane ride-on auto scrubbing machine capable of auto scrubbing 30,000 sq ft per hour. 1-Call has the equipment for any size job you need cleaning.